DEV-IOT6U: Industrial IoT ARM Development Kit | EMAC Inc. Designed and manufactured in the USA, the DEV-IOT6U is an easy to use Industrial IoT ARM development kit. This simple to deploy Internet of Things dev kit is based on the EMAC SoM-iMX6U; an ultra-low power System on Module (SoM) and the SOM-112ES carrier board. The kit contains all the necessary cables, software and hardware to simplify developing for the Internet of things. The SoM-iMX6U is an industrial temperature ARM Cortex A7 528 MHz iMX6 UltraLite system on module with 4GB of eMMC Flash, 16MB of serial data flash, and 128MB of LP DDR2 RAM. The development kit feature 8x MPIO Lines, 2x RS232 ports, 1x USB to Serial & 1x RS232/485 Port, 3 USB Host ports & 1 USB Device Port, 1x 10/100 BaseT Ethernet, Wifi, & Bluetooth. With an APM Sleep mode as low as 3.5mA, the DEV-IOT6U can run off an optional external battery when developing for remote installations. Using the SoM approach, product lifecycle concerns for the processor, memory and other SoM based components are minimized. It also allows clients to develop a product using a commercial off the shelf (COTS) system development/baseboard/carrier board for the proof of concept or production units. If the product or project has specific dimensional, I/O or connector placement requirements a custom carrier board can be created in as little as a month. 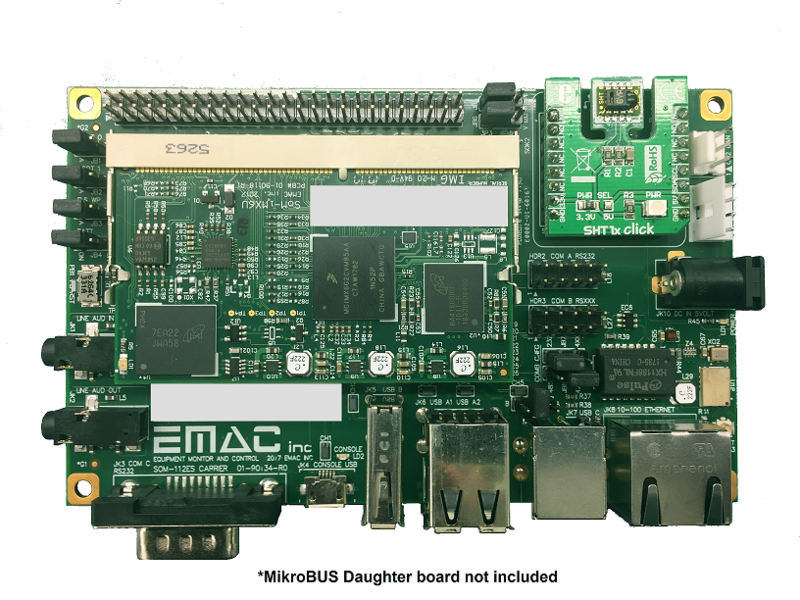 Use of an off-the-shelf carrier board allows clients to start developing their software while the custom carrier board is being designed and built. Ultra Low-Power consumption of 3.5mA APM Sleep, or less. IPEX Antenna included for development.